A lot of people appreciated my last post on the distribution of road fatalities across the region: it was featured on two Streetsblog posts, "Today's Headlines" and Streetsblog.net. Tonight I'm going to turn to another goal, increasing energy efficiency. Our transportation system is incredibly inefficient, as you can see in this awesome infographic from Good. 75% of the 27 quadrillion BTU of energy spent on transportation is wasted. To a large extent it's because when we want to transport a 150 pound person (sometimes with a couple hundred pounds of other people or supplies, often not), we frequently use a large internal combustion engine to transport a 2-3 ton metal shell with them. When we want to transport ten thousand cubic feet of stuff, we frequently put it into containers of one or two thousand cubic feet, each with its own driver and a ton of internal combustion engine. These cars and trucks have also allowed us to sprawl out our houses, jobs, schools, stores and entertainment, so that people who live, work or shop in newer developments often spend hours of each day shuttling between them in cars, and goods that were once transported a few blocks by backpack or handcart are now carried for miles in trucks. I got the data from an Excel spreadsheet that someone at the EPA helpfully posted online. The Center for Neighborhood Technology writes, "The EPA obtains VMT estimates that the U.S Federal Highway Administration collects from state bureaus of transportation. The states formulate the estimates by conducting traffic counts in each county and projecting those figures to arrive at an estimated miles traveled per year in each county." The 2008 data is available (and here are the state and county FIPS codes, so you know which files to download; they're also in the 2005 spreadsheet), but I can't find a nice spreadsheet for 2008. I used a blank county map from the Tri-State Weather forum that turned up on Google Image Search, and colored the counties by VMT per capita: the darkest counties have over 12,500 VMT per inhabitant, and the lightest less than 5,000. 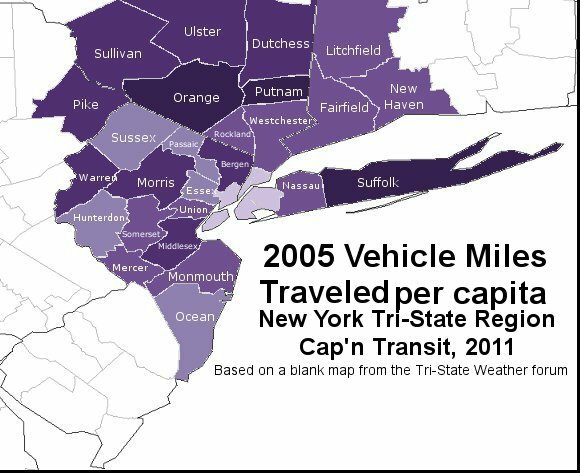 Putnam County in particular is off the charts, with 3.09 billion vehicle-miles traveled for a population of only 99,270, for 31,077 VMT per capita. Orange and Suffolk followed, with 13,171 and 12,682 VMT per person. There's a "Borscht Belt" (thanks to commenter CityLights) of milder sprawl beyond them, stretching from Warren through Sullivan to Dutchess, all in the 10,000-12,500 range, along with the raised-ranch and office-park counties of Bergen, Morris and Middlesex. The other Central Jersey counties plus Rockland, Westchester, Nassau and Connecticut are all in the 7,5000-10,000 VMT per capita range, and then Ocean, Sussex, Passaic and Hunterdon are in the 5,000-7,5000 range. The lowest per capita range includes the five boroughs of New York City plus Hudson County, NJ. Now let's take a look at how the counties contribute to the overall energy efficiency and emissions of the region. As before, Putnam's large per-capita figure accounts for only two percent of all vehicle miles traveled. Suffolk again leads the pack with 13% of the total, despite only having 7% of the region's population. 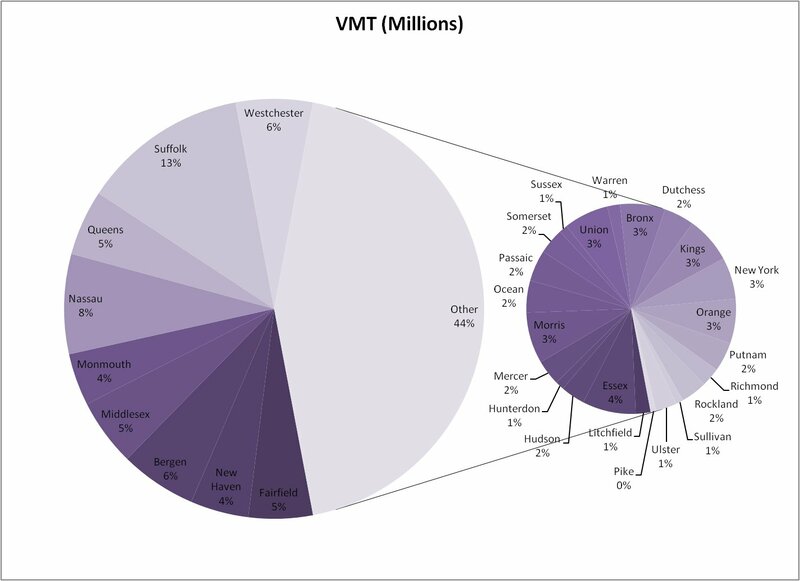 The top nine counties account for a majority of all VMT in the region: Suffolk, Nassau, Westchester, Bergen, Queens, Middlesex, Fairfield, Monmouth and New Haven. The three counties that appeared both on the fatalities list and the VMT list are Suffolk, Nassau and Queens. I'm seriously thinking that the best thing we could do to save lives and reduce our region's energy consumption and greenhouse gas emissions would be to tear up the Long Island Expressway and replace it with a new train line. The problem is that when you build transit in an area, it densifies, and some people simply don't want densification. That is why people move out to the suburbs, so they can escape all of the (often perceived) problems that come with densifications, including more traffic (a less dense area might have more traffic per capita, but it still has less traffic overall) and higher crime. In short, you may be able to convince some people to give up their cars and move to a more dense area (or stay in an area after it densifies), but there are a high percentage of people living in the suburbs who will oppose any large transit expansion. Even in urban areas, there are people who have good reasons for owning a car. For example, my family used to live in Brooklyn owned a car, but my father worked in the middle of nowhere in Westchester (and, before you say anything, it was a huge reservior, so there really was no way you could have the ridership to support a transit line). Now, we live in Staten Island and, because of the fact that we were used to having a car, we decided to keep a car, along with the associated expenses. People think that cars will bring them all kinds of good things. They're mostly wrong. Cars are unsustainable, and the more people we get to give them up sooner rather than later, the better off we'll be. Any suggestions you might have would be welcome. Just because I think it's good for people to give up their cars doesn't mean I'm judging any individual person who hasn't given theirs up yet. The biggest efficiency difference between cars and transit isn't the amount of metal per amount of human. It's that steel-on-steel has a much lower rolling friction coefficient than tires-on-asphalt, and transit vehicles have less frontal cross-section area than cars relative to vehicle mass. NYCT manages to have nearly trivial per-capita energy consumption even though at average occupancy, it has a ton and a quarter of train mass per rider. That aside, you're totally right about cutting VMT leading to cuts in traffic fatalities - in fact, that's the only thing that does. But replacing the LIE with a train line is not the first place to start (nor any place unless said train line goes to Manhattan). It's the most important to restrain travel growth in the suburbs, not in the city, where driving is already strictly for masochists. George, a couple of comments. First, in recent elections in the US, 77% of all voters voted to support transit. A majority of those voters live in the suburbs. Second, density means many things. Compare downtown St. Louis and downtown Daejeon, South Korea, two cities of comparable size. Downtown St. Louis is sunless concrete while there is a apartment complex with a private forest near downtown Daejeon. If you gave the people who live in those apartments the choice between living in a high-rise or a single family home, they would choose the single-family home. But they like that there kids can walk to two different elementary schools. They like that they can walk to work. They like that they can walk to shops and to the baseball park. They like that you can get the best fruit in Korea at their farmer's market. And they love having their own forest. Third, people in transit friendly counties own cars. A greater percentage of people in Copenhagen own cars than do New Yorkers. Same for Paris. I believe that one of the purposes of our transportation policies is to force people to drive. On of the reasons that I believe this is the belief that if we change policies, we would be forcing people to do something else.